Objective To describe growth before and after menarche. Design Nine hundred five fourth grade school girls were identified as a closed cohort from the first semester of 1993 for the observational study of the onset of menarche and its predictive factors. Settings Eight elementary schools in Taipei City and Taipei County, Taiwan. Main Outcome Measures Data were collected from self-administered questionnaires and school records. Height and weight were measured in September, January, February, and June, or only in September and February of each year. Results All subjects remained in the cohort until sixth grade, 410 of whom had their first menstruation before graduating from elementary school. Height, weight, and body mass index (calculated as weight in kilograms divided by the square of height in meters) at each time point were plotted against 2 time scales: chronological age and time from the onset of menarche. Growth velocity of height and weight across the onset of menarche was assessed with slope change using the mixed-effect model analysis. Conclusions The results support the hypothesis that height velocity reaches a peak 1 year before menarche but height velocity stopped increasing within 1 year after menarche. The change in weight velocity reveals no obvious growth spurt at age of menarcheal onset. BODY SIZE factors, including height, weight, body mass index (BMI), and body fat percentage, have long been found to be strongly associated with the onset of menarche.1-6 The relationship of the growth spurt in height and weight to menarche has long been studied.5-11 A more classic theory by Simmons and Greulich10 suggests the existence of synchronization of age at menarche and skeletal development. Frisch and Revelle12 and Frisch and MacArthur,13 on the other hand, proposed a critical weight and weight gain for the onset of menarche based on longitudinal growth data of 181 girls, while they never actually measured body fat in their subjects. Several studies5,6,14,15 support the height hypothesis that the growth velocity of height reaches a peak 1 year before menarche, slows down thereafter, and stops within 1 year after menarche because of the closing of epiphyses of long bones. Using factor analysis, both Ellison16 and Elizondo17 found a relationship between age at menarche and height rather than weight velocity, supporting the more predominant role of skeletal growth than body fat accumulation at the time of menarche. Also, Stanton et al18 found that the relationship between expected weight gain and the onset of menarche was not as strong as expected. A study by Groos and Smith19 in a high-malnutrition area of Papua New Guinea, however, supports the weight hypothesis: in their study of 310 girls, they found that weight was more closely associated with the onset of menarche than height. But from their plot, the height spurt was more prominent than the weight spurt across ages of the onset of menarche. More recent studies on growth and maturity of adolescents in Oman,20 Croatia,21 Catalonia,22 and Senegal23 all present growth curves of height and weight at different ages, but none address the growth of these body measures across ages of the onset of menarche. Locally, only 1 study reported this issue based on a cross-sectional sample in central Taiwan.24 Most of these studies15,21-24 were cross-sectional, using descriptive methods or simple statistical models. All growth curves of height or weight presented in these studies may not be able to differentiate the various growth patterns of height or weight on different menarcheal ages of onset. The aims of this study are to describe height and weight change across ages of the onset of menarche among girls before graduation from elementary school and examine the effects of the onset of menarche on height and weight change. Nine hundred five fourth grade girls from 3 elementary schools in Taipei City and 5 in Taipei County, Taiwan, were identified as a closed cohort from the fall semester in September 1993 and followed up once a year. All subjects in the cohort were followed up to the end of sixth grade in June 1997. Data were collected once a year between October and December from self-administered questionnaires and school records. All class teachers received one half-hour of instruction before the questionnaires were distributed in class. Consent forms were obtained from school authorities, class teachers, school nurses, study subjects, and parents before the interviews were conducted. Information about dates of menarche were collected from questionnaires and were double-checked with the dates received at follow-up in June 1997. Height and weight data were obtained from school health records in school centers. All heights and weights were measured each September, January, February, and June, or at least in September and June by school nurses. Body mass index was calculated as weight in kilograms divided by the square of height in meters. Four hundred ten (45%) of 905 subjects had their first menstruation before graduating from elementary school. First, we used a robust locally weighted regression method25 of S-plus software (MathSoft Inc, Seattle, Wash) to conduct empirical smoothing growth curves for heights, weights, and BMIs against the chronological age and the time from menarche, which is the time difference between chronological age and menarcheal age, respectively. Growth velocity of height and weight across ages of the onset of menarche was assessed with slope change. The chronological age, age at menarche, and school were adjusted as covariates in the fitted model. In this longitudinal study, each schoolgirl had 4 to 8 height and weight measures, which are correlated. Furthermore, individuals' birth heights, weights, and growth rates may be varied owing to some unmeasured factors, including genetics, environment, nutrition, etc. Therefore, the mixed-effects linear regression models, which are a generalization of the standard linear model, are used to handle the correlation of height and weight measures within each girl as well as the natural heterogeneity of birth height, weight, and growth rates among girls. Specifically, the coefficients representing birth height, weight, and growth rate in the mixed-effects model are assumed to be random effects, which are normally distributed with zero means and unknown variances. The adjusted slope changes of the height and weight on the different groups of menarcheal ages were estimated by using the procedure of the mixed-effects models in the SAS software (version 6.12) (SAS Institute Inc, Cary, NC). Table 1 gives the distribution of the menarcheal age for the 410 girls (45%) who had their first menstruation before graduation from elementary school. Only 5.1% and 14.9 % of 410 girls had menarche before age 10 years and after age 12 years, respectively. Figure 1 shows the empirical smoothed growth curves for heights, weights, and BMIs against the chronological age for 4 menarcheal age groups. Figure 1 shows that the girls with earlier menarche were taller, heavier, and had the highest BMI at the time of menarche. The average increase in height for those with early menarche slowed down after age 12 years (Figure 1, A), but we found that the heights for the girls with an older menarcheal age continue to increase. Furthermore, Figure 1, B and C, shows the steady increase in weight and BMI for each menarcheal age group. Figure 2 shows the empirical smoothed growth curves for heights, weights, and BMIs against the time from menarche for 4 menarcheal age groups. Figure 2, A, shows that the average increase of height slows down within 1 to 2 years after menarche for the girls with a menarcheal age younger than 11 years. However, weight and BMI steadily grow for girls with older menarcheal ages (Figure 2, B and C). A, Height vs chronological age (N = 905). B, Weight vs chronological age (N = 905). C, Body mass index (BMI) vs chronological age (N = 905). BMI was calculated as weight in kilograms divided by the square of height in meters. A, Height vs time from menarche (n = 410). B, Weight vs time from menarche (n = 410). C, Body mass index (BMI) vs time from menarche (n = 410). BMI was calculated as weight in kilograms divided by the square of height in meters. In the analysis of the growths among subjects in this study, we consider 2 time scales: (1) chronological age, and (2) time from menarche. After controlling the heterogeneity of individuals' birth heights and growth rates for the chronological age among girls, the average change in height for chronological age adjusting for menarcheal age was estimated based on all 905 subjects. The average increase in height per year of chronological age for those aged 11 years or older at menarche is 1 cm more than the increase for those aged younger than 11 years at menarche. Although changes in growth rates before and after menarche based on the relationship between height and chronological age is statistically significant, the magnitude of the slope changes before and after menarche are not more than 0.3 cm per year. In addition, growth patterns between those younger than 10 years at menarcheal onset and those with menarcheal onset between ages 10 and 11 years are not significantly different. Growth in height with respect to the time from menarche adjusting for the same school based on 410 subjects who had menarche during the study period is given in Table 2. For menarcheal onset age younger than 10 years, the average growth rate of height significantly decreases (with >1 cm/y) for 2 years after menarche compared with that within 1 year after menarche. Moreover, for a menarcheal onset age older than or equal to 10 years, the height velocity reached its peak within 1 year before menarche and significantly decreases by about 1 cm/y after menarche. However, the results based on the mixed-effect model analysis for weights and BMIs did not show the significant pattern between the weight or BMI velocity and age at menarche as the patterns exhibited in heights. 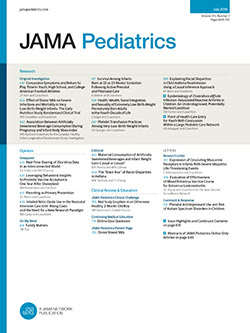 The results of this study support the height hypothesis10 and are consistent with the results of other studies5,6,14-18 that suggest a relationship between age at menarche and skeletal maturation as opposed to a relationship between menarche and a threshold of weight or fat accumulation among school-aged girls in Taiwan. The results from the empirical smoothing analysis and the mixed-effects model analysis are consistent with each other. Two time scales, chronological age and time from menarche, are considered in the analysis. According to the chronological age scale, the height velocity for subjects with later menarche is more rapid but there is no obvious growth spurt for height associated with menarche. In the height analysis with the time from the onset of menarche scale, we found that the peak of height velocity was reached 1 year prior to menarche. This study did not find any effect of weight on the onset of menarche as suggested by Frisch and Revelle12 and Frisch and MacArthur.13 Only one recent study in Papua New Guinea19 supported this hypothesis. It is possible that the nutritional status in Taiwan is generally good and there may be no differences in fat accumulation among school-aged girls in Taiwan. This study has the following strengths and contributions: first, it involved a large longitudinal sample with a high follow-up rate. Most previous studies15,21-24 were cross-sectional. On the other hand, some longitudinal studies12,13,17,18 suffered from small sample size. The study subjects were selected from 3 elementary schools in Taipei City and 5 in Taipei County. Though the selection was not random because of administrative concerns, the socioeconomic status and geographic distribution of the schools were wide enough to represent elementary schools in the Taipei area. The effect of loss to follow-up was negligible. Second, the identification of the onset of menstruation is clear, was easy for each subject to identify, and was double-checked. Height and weight records were measured by school nurses at school health centers through standard criteria and thus were reliable. Also, height and weight were measured independently, while neither the subjects nor their teachers had previous knowledge of height, weight, and the onset of menarche. There would be minimal possibility for information bias. In the statistical analysis, we made 3 contributions: first, we separated groups with different menarcheal onset ages. Among all previous studies, only one4 described growth curves of girls with different ages of menarche. Second, we studied the growth curve vs both chronological age and time before or after menarche. No previous studies used this approach. Third, we used the empirical smoothing analysis and the mixed-effects model analysis. Most previous studies used descriptive methods or only simple statistical models. Our study still has the following limitations. We did not have height and weight data of the subjects at younger ages. We did not collect other landmark data, such as breast and pubic hair development, because of ethical concern. Our height and weight data collection lasted only 3 years because students spread to more than 20 different junior high schools after graduation from elementary schools. We continued the follow-up of the onset of menarche but could only describe the height and weight changes across ages of the onset of menarche of girls who had their first menstruation before graduation from elementary school. Accepted for publication December 9, 1999. This study was supported by a 3-year grant from the National Science Council of Taiwan, Taipei, Taiwan, NBC 83-0412-B-002-265, NSC 84-2331-B-002-194, and NSC 85-2331-B-002-256 (Dr Chie). We are grateful to Yung-Hsin Liu, BS, Ping-Chung Chang, BS, Jenny Chi, MS, Virginia Wu, MS, and Angela Chen, MS, for their helpful assistance. We would also like to thank the Bureaus of Education of Taipei City and Taipei County for administrative help and the 8 schools, as well as all of the subjects, their teachers, nurses, and mothers for participating and for undergoing interviews. Reprints: Wei-Chu Chie, MD, PhD, Department of Public Health, College of Public Health, National Taiwan University, Room 209, 19 Hsuchow Rd, Taipei, 10020, Taiwan (e-mail: weichu@episerv.cph.ntu.edu.tw).